While the vessel is filled from inlet/outlet liquid valve, please open the vent value at first; connect the flexible metal hose to the inlet/outlet liquid valve; open the inlet/outlet liquid valve, through which the liquid medium may be filled; when the liquid filling is carried out, the inlet/outlet liquid valve shall be switched off. 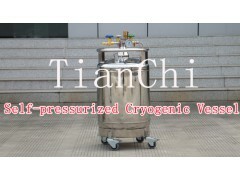 When you use this vessel to transport any liquid medium, .please close the inlet/outlet liquid valve and the pressure increasing valve; and the vent valve shall be switched on. The package box base shall be paved under the container seat ring and the container shall be fixed reliably with the truck. (4). When the pressure is increased to 0.05 MPa (0.5kg/cm2), open the inlet liquid valve, namely, the liquid may be supplied continuously.